LAT: 16:51, 6 errors relating to that Natick Nest in the upper left and another block of them towards the bottom. Nothing I could even begin to make an educated guess at after a couple of minutes staring at it. Ruined the grid/experience. Newsday: 21:37, no errors. Washington Post: 18:40, no errors. LAT: 18:29, with a one-square error I can only blame on haste and inattention: I wrote in (Geoffrey) “BEANE”, stupidly thinking I remembered how to spell his name, noticed “A IS” (for Evidence!) and somehow said to myself, “Sounds just fine to me!”, understood the theme but failed to notice that I had a “BEA” floating over an “IRIS” … gee … whattayagonnado, some days you just shouldn’t be on the playing field! … 😳😜. Newsday: 20:27, no errors. Haven’t gotten to the Washington Post, (which was late appearing last night) and I have other things to do … 😳. Washington Post: 21:51, no errors. An okay puzzle, but it appeared in a somewhat different form than it usually does, with a smaller grid and numbers in the grid that were quite hard for me to read – the same problem I have with the weekday Universal puzzles in my newspaper. Oh, well … no matter … I can cope … 😜. And … for lack of anything better to do, I finished the last two Universal Sunday puzzles: 22:54 and 21:27, respectively; no errors, no missteps, but I learned a new word from each of them: “QUANT” and “LIBERO” (both of which I will probably have forgotten a week from now 😜). 29:13 and DNF; 8 unfilled words. Lots to dislike in this one: an annoying obsession with Pocatello (who *cares* where that is?) and multiple religious tract references are about all that’s needed to make this a real slog. 49:18 with no errors. This was much more pleasant than the NYT#0317 from my paper today which had Jeff Chen teaming up with someone as he usually does. This always seems like two against one. 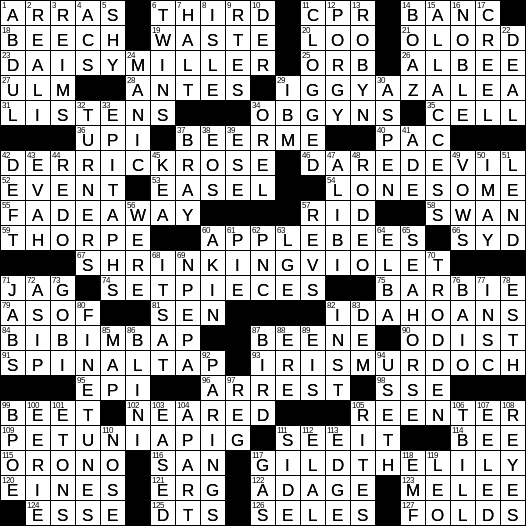 Add in Will Shortz and it kinda stinks even though I finished it with no errors. GIVE US MERE MORTALS A BREAK. I got lost in that Natick Nest in the upper left too. Jeez! Only one square wrong at the ARRAS/REALI cross. I had never heard of the word ARRAS nor had I ever heard of Tony REALI. I’m learning to like these Sunday LAX puzzles more. They are way easier than the Sunday NYT. I got those blanks filled in.